It won’t happen to me..? Summer is just around the corner and what’s not to love about festival season?! However, here’s a sobering reminder of what could happen if you aren’t careful with your bags. It’s filmed at Benicassim 2013 (sorry its so old! ), but the message is still true now and applies for any trip anywhere in the World. In short: don’t ever leave your bags or personal belongings unattended. Seems simple, right? It is, but then as you’ll see from the experiences of the people in the video there are so many distractions it is easy to drop your guard for a couple of minutes. And that’s all it takes. If you want to know more about things to do to reduce risks and to stay safe, check out our Staying Safe page. Also make sure you have travel insurance. We have a simple guide to help you understand why you need it, how it works and how to use it. Buy your insurance when you start paying for flights. It can cover against delays and cancellation (within reason). Find out more, get quotes and buy online here Work Abroad and Gap Year Insurance. When will I get my IEC invitation? Lots of people are still waiting for an IEC invitation and it’s hard to figure out when you’ll get yours. Here’s our quick guide to explain how things work and an indication of when you may get an IEC invitation. The data for this category are based on the information available on 29 March 2018. Quota 5000 – the overall number of IEC Working Holiday Visas expected to be issued during this season. Invitations issued to date 6,765 – the number of people who have been invited to apply. A surprising number of people either won’t go on to complete an application or will be rejected (possibly for eligibility reasons) so the number of invitations issued in one year can be far greater than the Quota. Spots available 832 – Quota less actual visas issued. Candidates in the pool – how many IEC profiles exist and are hoping for an invitation. I have a profile in the pool. How long before I get an application? Invitations are sent at regular intervals (typically every 2-4 weeks). However, only a small number of invitations are made each time (a percentage of the overall pool). The aim of the administration of the programme is to spread issuing of visas through the year rather than have a big rush at the start of the season. What are my chances of getting an IEC visa? The selection process is random. The higher the number of candidates in the pool, the lower your chances of being chosen. However, it is random, so you always stand a chance. There aren’t any ways to “play” the system. However, statistically the best option is to get a profile submitted at the start of the programme (it normally opens in November). You will then be considered for each round of invitations. Additionally, at the very start of the programme the number of candidates is likely to be lower so your chances are slightly improved. Is it worth submitting a profile later in the year? Yes! The invitations are issued at random so for each round you will stand an equal chance to all the other people in the pool. You could get lucky! The IEC website provides comprehensive information and useful FAQ’s. International Experience Canada - Open! International Experience Canada – Open! If you are thinking about a working holiday to Canada then its worth spending some time becoming familiar with eligibility and application process. The visas are available to 31 different nationalities although specific conditions vary among them. In some cases there aren’t as many visas available as there are people applying. In this case, to improve your chances you should submit your Profile as soon as you can. The links and visa information further down the page provide a useful introduction. If you’ve already got your IEC visa and are about to set off then the following links offer essential information to help you plan your trip. Canada Winter Season Employment Guide. With great tips, links and ideas to help prepare for the job hunt. Travel insurance is a compulsory aspect of the IEC visa. Don’t underestimate the importance of this. Check out our insurance guide to help you choose the right policy. Get an Insurance Quick Quote here. How to transfer your support funds to or from Canada. Follow us on Facebook and receive updates and news. Create a GCKey – this is an online, password secured, log-in for the CIC website. Once you’ve created your GCKey you’ll be able to log-in to MyCIC and create your Profile. Create an IEC Profile – the Profile is an expression of interest and places you in a Pool of similar candidates wishing to apply via the IEC programme. At this stage you do not have a visa but CIC know that you want one! You should receive notification that your Profile has been accepted. NOTE FOR UK APPLICANTS: When doing the Come to Canada guide, answer your questions carefully, you’ll have options for GBR-UK (for UK British nationality) and England, Scotland, Wales or Northern Ireland for country of residence. CIC will contact applicants through a series of Rounds – these are dates spread across the calendar year when CIC will contact applicants in the Pool and invite them to proceed with the official IEC permit application. IMPORTANT: once you are invited to continue with your application you have 10 days to respond (accept) and 20 days to complete the online application and include all supporting documents. If you fail to meet either of the deadlines then you could jeopardise your place. For certain nationalities (including UK and Ireland) it is expected that there will be more people in the Pool than there are available visas. This means that there’s a chance some people won’t get invited to continue with the application. Some nationalities (including Irish nationals) have the option to apply for one of three types of IEC: Young Professional (YP), Internship/Co-op (Internship) or Working Holiday. The YP and Internships aren’t always as competitive as the Working Holiday and can provide a more assured way to get a permit (subject to eligibility). The Working Holiday category is designed for British citizens, who intend to travel in Canada and who wish to find temporary paid employment to help pay for their trip (up to 24 months). pay the participation fees (CAN$150) and permit holder fees of CAN$100. Successful applications are authorised for a stay of 24 months or until the expiry of your passport, whichever is sooner. The information above is correct at the time of publication. However, eligibility, fees and availability are subject to change and you should always check details with Immigration Canada before submitting a visa application. Note: in 2016 a total of 6,000 permits were issued. However, there were over 9,000 applicants. Some people didn’t get invited to apply for a visa. Canadian Immigration provides very comprehensive information about all aspects of the programme (including your arrival in Canada and job hunting) on their website. Read through the website carefully, finding the answers online is likely to be quicker than seeking an answer through the High Commission. Under this category work must be paid and it doesn’t permit self-employment. Your employer must meet all labour laws in the province or territory you plan to work. The Young Professionals category is designed for Irish citizens, particularly post-secondary graduates, who wish to further their careers by gaining professional work experience in Canada. Participants must have a signed letter of offer or contract of employment (up to 24 months) before submitting a profile to the pool. Note: As an Irish citizen, you may participate in the Young Professionals category only once. If you meet the eligibility criteria, you may participate one more time in IEC through the International Co-op (Internship) category. The International Co-op (Internship) category is designed for Irish citizens who are enrolled at a post-secondary institution in Ireland. Participants must be registered students for the duration of the internship. Participants must want to complete a work placement or internship in Canada to fulfil part of their academic curriculum (up to 12 months). Participants must have a signed letter of offer or a signed contract of employment before submitting their profile to the pool. As an Irish citizen, you may participate in the International Co-op (Internship) category only once. If you meet the eligibility criteria, you may participate one more time in IEC through the Working Holiday category or the Young Professionals category. The Working Holiday category is designed for Irish citizens, who intend to travel in Canada and who wish to find temporary paid employment to help pay for their stay (maximum 24 months). As an Irish citizen, you may participate in the Working Holiday category only once. If you meet the eligibility criteria, you may participate in IEC one more time through the International Co-op (Internship) category. Note: in general terms the programme for Irish nationals was not oversubscribed whereas the equivalent UK programme was. The information above is correct at the time of publication. However, eligibility, fees and availability are subject to change and you should always check details with Immigration Canada for submitting a visa application. Canadian Immigration provides very comprehensive information about all aspects of the programme on their website. Read through the website carefully, finding the answers online is likely to be quicker than seeking an answer through the High Commission of CIC. 1000’s of people are dusting down their salopettes and preparing for a winter season. For many, travel insurance is an afterthought. This could be a costly mistake. Policies linked to banks and credit cards are normally limited by duration (typically 30, 60 or 90 days) and often by the activities you can do. Check: does the policy cover you for the full length of your trip; does it include the activities (skiing, snowboarding, on/off piste) and does it cover the country you are visiting. Note: short term cover may not be valid if you knowingly rely on it for a trip that exceeds the maximum length of cover. You need to live in Canada for a qualifying time before you can apply for their healthcare. Plans are regional and differ from one Province/Territory to another. They do not provide international cover; ie they won’t fly you home in an emergency situation; similarly they won’t fly a family member to be with you if you are hospitalised. They won’t cover baggage or travel delay. You may qualify for Canadian Health Care, but it isn’t comprehensive for an international visitor. Trying to buy a comprehensive policy once you have already started your trip is difficult. Only a few insurers offer this option. In addition it is unlikely that your ski gear will be covered unless you have the right level of insurance from day one (ie if you are planning on taking your own board/skis, boots etc for the whole journey). In North America, they are very cautious about skiing/boarding injuries and are very quick to give x-ray and MRI. According to the FCO, an average medical claim in 2012 cost £914; the average claim for personal accident was £7,500. A worthwhile Gap Year Travel insurance policy including winter sports could cost in the region of £60 per month. Its a significant amount if you don’t end up needing it. But if you do have an accident on the slopes the cost could be £10,000’s and it will have been an invaluable investment. Once you have your Travel Insurance, make sure you read the documents carefully. If you are tempted to skim read them then pay attention to the “Exclusions” sections. These highlight things that you won’t be covered for and can be very enlightening. You are responsible for checking that your insurance is right for you. * There are reciprocal arrangements in place within the EU, but you will need to have a European Health Insurance Card. ** If you are being transferred to another country by your employer they should be providing a full travel/health policy in which case you should have cover. Make sure you check before you travel. Good Gap Year Travel insurance is a necessity not an option. 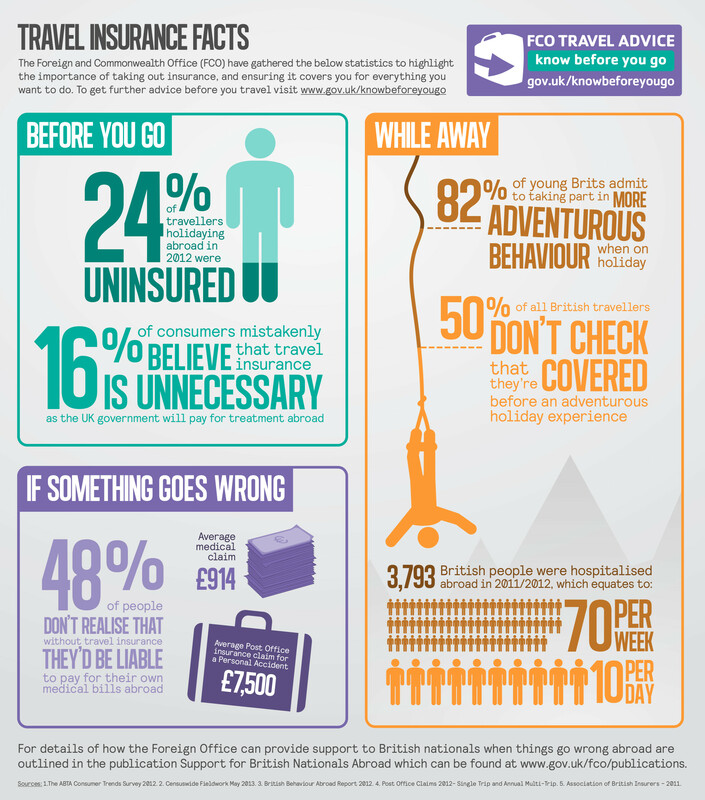 48% of people travelling abroad don’t realise that without travel insurance they would be liable to pay for their own medical bills abroad. Learn how a good insurance policy can protect you when you are away here. And for more fascinating (and worrying) facts; check out the information from the FCO below and at their website here. For those curious about the picture above: this is the Bobea Elatior and early Hawaiians used it for making canoe paddles. Don’t get stuck up a river without a paddle. Get yourself some decent travel insurance. So, when is the best time to visit South Africa? South Africa is a year round destination and the different seasons have different things to offer. Here are some thoughts to help you plan. The dryer winter months (May to October) are popular for safaris and game drives as the animals tend to gather around watering holes making them easy to find. There’s less foliage so viewing through trees/bushes is also easier. This is probably more significant if you are going on a day’s safari as part of a holiday. However, the summer months (November – April) are typically when animals give birth to their young, so if you are after cute and cuddly this is a better time. If you are working on a game reserve as part of a volunteer placement the timing is probably less important as you’ll have ample opportunity to work with and among some amazing wildlife everyday! If you are interested in whale watching make sure you visit between June and October to witness the remarkable migrating southern right whales. Every year they return to the same place and put on an amazing display. Viewings and whale watching trips from the coastal town of Hermanus. Our South Africa Wildlife Volunteering experiences are based around Johannesburg. These hands on experiences will allow you to work alongside some amazing animals and the projects are available throughout the year. Wildlife conservation is ongoing regardless of the weather! You’ll enjoy warm summers and mild winters. South Africa Wildlife Volunteer. South Africa’s climate ranges from Mediterranean in the south-west corner of the country to temperate in the interior plateau, and subtropical in the north-east. A small region in the north-west has a desert climate. Summer temperatures in South Africa range from average highs of 28°C to average lows of 8°C. Winter temperatures are cooler ranging from 1°C at night to around 18°C in the day. These are averages and there are regional variations. For example Durban in the winter can be a very pleasing 26°C. Annual rainfall is under 500mm a year. The Western Cape (Cape Town) gets most of its rain in the winter, differing from the rest of the country which has summer rainfall (typically hot sunny days interrupted by afternoon thunderstorms that clear quickly). South Africa has an amazing coastline and the more time you have the more you’ll be able to explore. Its climate and geography have attracted all sorts of beach and water sport enthusiasts. It has world-class surf beaches (including Cape Town, Durban, Jeffreys Bay and East London) and is also popular for wind and kite-surfing, sea kayaking and surf skiing. There are no less than 41 blue-flag beaches to enjoy! Visit between March – September for the best surf (although its good all year). South Africans love visiting the beach after a hard day at work; enjoy a sun-downer by the beach while soaking up the last of the sunshine. Summer is the best time to visit the beaches. Although the beaches of northern KwaZulu-Natal are warm and sunny even in midwinter. Spring and autumn provide the best climate for hiking. The summer can be hot over most of the country making hiking more challenging (in the Drakensberg mountain range summer thunderstorms add an extra hazard and there is a good chance of mountain snow in winter). In Western Cape, the winters are wet, so it’s not necessarily the best time for hikes. So when is the best time to travel to South Africa? Any time, but when you get there make sure you explore and enjoy every minute of it. Data theft is an increasing problem and travellers are among those at greatest risk. With a few simple precautions you can stay safe online. Free Wi-Fi hot spots are great – especially when you are travelling. Keep your international data charges down, free Viber/Skype calls to friends, catch up on emails, update social media, track your bank balance and upload your latest photos. But how safe it is to use a “free-Wi-Fi” connection? Techies advise it takes minimal hacking skills to monitor and/or hijack communications over a public Wi-Fi network. Eavesdropping on emails and web browsing is as simple as pressing a button and travellers are more vulnerable than most having to rely on unfamiliar networks in new destinations. However, with a few simple precautions you can help to reduce the risk. The security of your Wi-Fi connection is as important as the security of your passport. Use a Virtual Private Network (VPN); this creates a secure connection to the internet. There are free and subscription options available. Make sure you get one that best matches your needs. The following video gives a good overview of the risks and precautions that you can take. Charging stations and kiosks are popping up everywhere and seem a convenient way to keep your device fully charged while you travel around. However, tech experts warn that hackers can rig the charging station and intercept data and downloads. This latest hack is commonly known as “Juice-jacking”. “Juice jacking” is the theft of personal data through a public charging point. Ultimately, the safest way to charge your device is using a charging adapter and plug socket connection. The safest way to charge your device is using a charging adapter and plug socket connection. Finally, a word about device theft. Lap-tops, tablets and mobile phones are at high risk of theft. Please take good care of them. Always protect access to your device with a password. We have more useful information about travel safety here. Many insurance policies limit the cover for valuable items and this can include mobile phones/tablets/laptops. Always check the policy carefully to understand any limitations in the insurance, excess charges and maximum cover amounts. Still looking for travel insurance? Looking for a hotel internship next year (2017)? Make sure Canada is top of your list: fantastic 4* & 5* hotels, amazing resorts, breath taking scenery and the warm, friendly locals. Register NOW and get the visa process underway to stand the best chance of having an amazing Canadian hospitality placement in 2017. Below we outline the benefits of registering in 2016 for a hospitality, travel/tourism placement in Canada starting in the summer of 2017. Working Holiday Store has strong relationships with some of the best hotels in British Columbia and Alberta and would be pleased to help you plan your adventure. Our services include, hotel interviews, CV writing, interview training, visa help, tax & banking information and travel/insurance guides. Apply NOW? Are you serious? It may seem crazy to apply this early, but we recommend that you start NOW. As you may (or may not) be aware, the Canadian visas are in high demand. If you start the process now you’ll be able to secure your International Experience Canada visa (the visa we use to support our placement programme) this year and avoid any visa rush next year. A little effort now will make your life a lot more simple next year. Our experienced team will help you with the visa process and be on hand to answer questions. Will my visa be valid if I apply now? Yes. The International Experience Canada visa allows up to 12 months to start your trip. So, as an example, if you get your visa in September 2016 you will be able to travel to Canada at any time up to September 2017. You will be granted a stay of up to 24 months (depending on your nationality) from your arrival date. Most of the summer placements start in May and June which means you will start your trip well within the visa validity. The visa application process is a little random and processing times vary. If you apply for your visa now then you will have the comfort and peace of mind knowing that this aspect of your placement is already taken care of. You can wait until next year but visa processing times and eligibility are subject to change and it is possible that applying later may cause delays and inconvenience. Hotels will also be reassured to know that you’ve already been issued with a visa and may look more favorably on your application. Isn’t it risky applying for a visa before I have a placement – what if I don’t get a placement? Our comprehensive placement service is designed to help enthusiastic, hardworking, competent young students to find work placements. As long as you have the right attitude then we are confident that we will find you a placement (and if we can’t we refund your programme cost). Unfortunately, we can’t make an absolute guarantee as the hiring is ultimately down to the hotels. However, we will do all we can to help you succeed. Visas (or more accurately Permits) are granted by Citizenship and Immigration Canada (CIC for short). Each year CIC allocate quotas of visas to a number or partnering nationalities. The numbers of visas is different for each partner country. In 2016 the visa process requires that you register your interest with CIC by creating an online profile. Then, through the year at regular intervals, CIC invite people to continue with the visa process. These invitations are offered at random so there is no way to determine whether you will be invited or not. If you start your application now, you will stand a much better chance of getting the visa. Is it the same for all nationalities? No. For some partner countries (for example the UK), the number of people who want a visa exceeds the annual allocation available. Some people will be unsuccessful – but starting early improves the chances. Other countries have a more suitable allocation (Ireland) and the number of places better matches the level of interest – in this case there are more visas and a greater likelihood of getting a visa. For some countries (Australia) there isn’t a limit to the number of visas that they will consider. I’m really interested but can’t commit. What should I do? We continue to help enthusiastic students throughout the year. We monitor the visa process carefully so that we can offer the most accurate information. Applying in 2016 for a 2017 placement isn’t essential but for those who already know that Canada is the destination of choice, it makes good sense to start the process now. If you aren’t ready, don’t panic. Give it some more thought, let us know if you have any questions and then get back in touch when you are ready. I’m really interested in a Canadian hotel placement next summer. What should I do next? Please follow the link to our programme page. Read more about our comprehensive package and then upload your CV for free so we can give you an assessment. One of the team will get in contact with you to discuss your basic ideas for placement and to provide some realistic feedback regarding placement options. They will also discuss visas and next steps. We hope that this information is interesting and look forward to helping you to find an amazing placement in Canada. South Africa wildlife volunteering; book now for summer/autumn 2016! Volunteer on an African game reserve and actively contribute to the well-being of the animals and their protected environment. Your trip can last from 2 weeks to 8 weeks and will include airport transfers, accommodation, meals, training/supervision and orientation. The South Africa wildlife volunteering experience is ideal for any animal loving person who wants to witness amazing wildlife in its natural habitat. You don’t need to have specific qualifications, just a love of animals and be prepared to provide hands on support to the conservation project. Choose between 2 South Africa Wildlife Volunteering projects: Big 5 Game Reserve or Equestrian Centre. The Big 5 gives you the chance to be fully immersed in the running of the reserve. See first hand the work that is involved in maintaining such an important conservation programme. As its name implies, you can expect to see lion, elephant, rhino, leopard and buffalo along with 100’s of other indigenous animals. The Equestrian programme combines wildlife conservation with a unique opportunity to learn about the running of an equestrian centre and improve your riding. Most days are divided between the Equestrian Centre and the Wildlife Reserve. You can improve your riding skills and learn new techniques specific to the environment. When you aren’t riding you’ll work at the wildlife reserve where you’ll learn about conservation and assist the rangers with daily tasks. Trips depart twice monthly throughout the year. Prices start from a very reasonable £995. We are now taking bookings for summer/autumn 2016 and places are offered on a first-come first-served basis. Start your application today to ensure you get a space on one of these once-in-a-lifetime trips (you can apply as an individual or with friends). If you lose your phone on the slopes, is it covered? Gap year insurance – warning! Travel Insurance: does your gap year/work abroad insurance cover you for everything you think it does? According to a report, 1000’s of people are travelling with inadequate travel insurance without realising it. They point out that in recent years the value of our personal belongings has gone up but travel insurance cover remains largely unchanged. This is especially apparent if you consider the high cost electrical items that we all want to travel with (mobile phone, tablet, laptop, digital camera, e-reader, etc). All of these items will fall under a sub-category of baggage cover called “valuable items” for which there is a significantly reduced limit of cover. For example: an insurance policy may promote £2,000 of Baggage Cover, but when you examine the policy you will notice that “Valuable Items” are only covered to a maximum of £200. Additionally, there may be a “single item limit” which will further restrict what you can claim for. Finally, if you take away the excess (the amount of each claim that is deducted by the insurance company on settlement) you can be left with a massive discrepancy between the true value of your items and the amount that you receive from your insurance claim. For those who skim-read their gap year insurance or holiday cover there is a real danger that they will mistakenly believe that all of their personal items will be covered to the generic overall “baggage limit”. In the event they need to claim, it can result in massive frustration and expense. Firstly, make sure you understand what the limits are. Read the small print and in particular look out for references to Valuable Items and Exclusions (some policies won’t cover certain valuable items like mobile phones). Once you know what is and isn’t covered you can consider your options. If you have Contents insurance for your home then it may include personal items on holiday. If it doesn’t, you may be able to add this option to the policy. But even here you need to read the small print. There will be a limit to the cover and normally it will only be appropriate for a short holiday rather than an extended working holiday. Any claim could affect your overall no-claims and you may need to pay a supplement. Limit what you take with you. One reason insurers restrict cover for valuable items is that they are high risk and easily stolen (especially if you are staying in shared accommodation). Also, high value items are subject to fraudulent claims and it is suggested that limiting the cover will deter false claims. Finally, take good care. At the end of the day, you need to exercise greater vigilance when you travel. Wherever possible lock valuables away or keep them with you. Never leave anything charging unattended, never leave your mobile phone on a table in a bar or cafe where it could be easily snatched. Keep laptops and tablets in a fastened bag and keep the bag in front of you where you can see it. Be careful leaving bags under chairs in cafes, bars and restaurants. Its a common place for theft. In the short term, it seems unlikely that insurers will change their approach to valuable items cover; and if they do, you can be confident that the gap year insurance premiums will increase. But, lets not be overly critical of the insurance companies. At the end of the day, they need to ensure that they collect sufficient money (mostly via premiums) to cover their outlay in claims (whether that’s for baggage, repatriation or massive medical bills). If the value of their settlements increases then their premiums will have to increase as well. There’s a simple logic to it. We have a responsibility to check the cover to be sure it is appropriate to our own personal needs and circumstances. So, for now, please read your policy carefully, take a couple of moments to add-up the cost of the personal belongings that you will travel with and finally, consider what you can do without. A lap-top is a travel luxury but keeping it safe at all times can be a burden. Online access via mobile phones is excellent and you’ll never be far from an internet cafe. So, on reflection perhaps you can do without your laptop? If you can, leave your current smart-phone at home and dig out something old and of little value to travel with. For more information regarding gap year travel insurance, how it works and what to look out for visit our Gap Year Travel Insurance page.